Yamaha MT-07 Full System Exhaust. The SC-Project line of Full System Exhaust options designed for the Yamaha MT-07 represent the very best in motorcycle exhaust performance at a price that delivers real value for money. SC-Project combine progressive design and extensive research with highly advanced innovative technologies, coupled with the handmade passion of Italy, to provide quality and exceptional excellence for our customers motorcycles. SC-Project are a leading world class MotoGP and World Superbike exhaust Factory and are the technical partner to the very best riders and teams in the world. SC-Project Factory have the highest level R&D competencies, dedicated to pushing the limits in the most suppressive and demanding conditions to ultimately offer maximum performance, superior weight reduction and extraordinary durability for our customers Yamaha MT-07 motorbikes. SC-Project use the very highest grade materials including 100% carbon fibre, full titanium and 304 AISI stainless steel with the precision of CNC machining and a highly sophisticated and unique production technique of double-layering carbon fibre for the ultimate in resilient finishes. SC-Project has also taken T.I.G welding to the next level and remain unparalleled, this has become a globally recognised feature of SC-Project exhaust systems, so too has the unmistakable deep, intoxicating and resonant full race sound. SC-Project exhaust systems have been designed, measured and studied to provide increased performance and torque throughout the entire RPM range, resulting in a much smoother power delivery and ride for our customers. 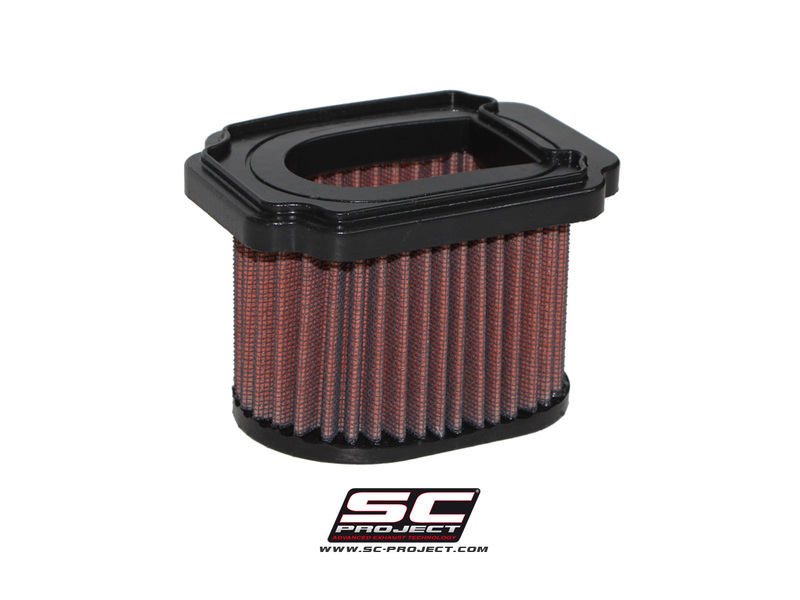 SC-Project: Advanced Exhaust Technology. MotoGP World Champion Exhaust. High temperature ceramic coated "Black Edition"
License plate obtained from CNC processes for the Yamaha MT-07 License plate made in ergal, totally obtained by the full part of the body through CAD/CAM tridimensional manufacture processes. SC-Project license plate is composed by a band obtained by the fullness, which holds the plate with an adjustable inclination.The extreme lightness and the highest structural rigidity together with an impeccable quality of finishes characterize this component.It is provided with the support for the reflector (law mandatory) and the supports to position of aftermarket arrows under the rear light.